In a long overdue post, I present some of favorite shots from the 2014 spring season. In an early season matchup between Kellenberg and St. Dominc's, rain fell steadily throughout. Despite the inclement weather they were able to play all 7 innings. DICKS Sporting Goods High School National Tournament. This shot was from the tournament's championship game at Madison Square Garden between Oak Hill and Montverde Academy. A long jumper from Jericho HS lands during a Track & Field meet at MacArthur HS. 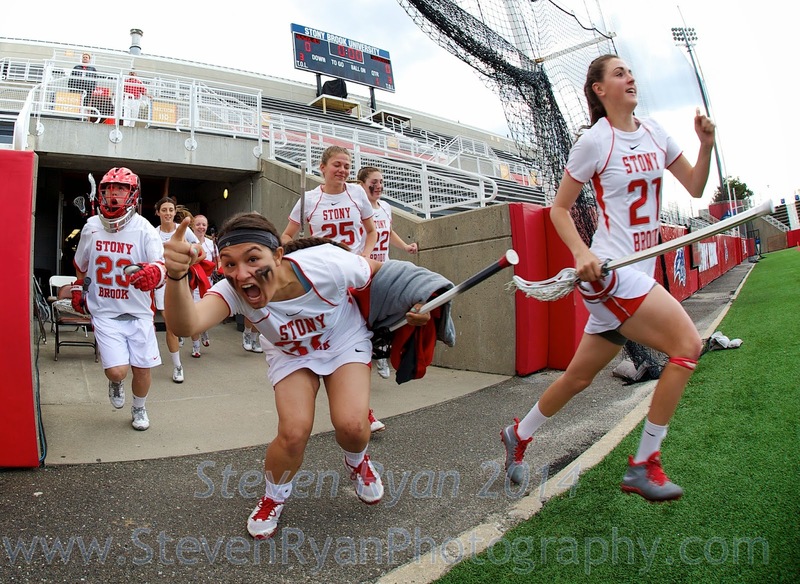 Stony Brook Attacker Margaret Fleming sprints out onto the field with her team prior to the American East Tournament Semifinal against New Hampshire. A pole vaulter during a Track & Field meet at MacArthur HS. CHSAA Girls Lacrosse semi-finals between Sacred Heart and Kellemberg. Louis Armstrong stadium is usually filled to capacity during the US Open in late August & early September. This match featured Nick Fox and Cory Seltman of Commack against Jordan Benjamin and Aaron Mevorach of Harley-Allendale-Columbia during NYSPHSAA Tennis Championships at the USTA National Tennis Center. Even though Louis Armstrong did not fill to capacity for this match, it still featured an intense battle on court.